Nourish Qi, promotes energy, very effective as a stimulant, for fatigue, lack of energy, promote endurance, etc. Royal King ®/Herba Natural Products, Inc. This product contains only natural herbs of the best quality. Purity, quality, and freshness are guaranteed to meet the highest standards. 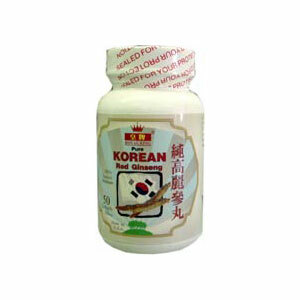 Each capsule contains 500 mg of Korean Red Ginseng. 100% natural, no sugar, sodium, preservatives, or artificial color added. As an addition to the daily diet, take 1-2 capsules after each meal, 3 times daily or prepare as tea.